About 3 yrs ago my mother married this man who i hate, who is now my step-father. He's constanly cheating on her and has had a baby with another woman and she's still with him. She's a Christian and he's not. He's totally oppisite of her. 1) Is there any thing that could be done to have him removed out of her and my life? 2) and another question how did he get this kind of control over her? Search the forum for Break Up and Hot Foot work. If he lives in the house, use Hot Foot Powder where he walks. Be cautious and careful that you are not caught at it. For break-up work, try looking up a break-up spell in an egg. This can be done without arousing much suspiction. Hi, my name is Jeanetta. I asked for help a little over a month ago with a hot foot spell that i order from lucky mojo. I'm not able to use it because where ever i put it down my husband will come in contact with it. The spell is for his deceased wife's daugther and her daugther. I want them so far away from us that's all i can think of these days and this is the reason why, my husband last wife died in 2007 he gave the trailer that they lived in to his step daugther and her daugther he told them all they had to do was pay lot fee and utilities which as to date they haven't done. We got married Feb 2009 and bought a trailer he can't pay bills here for paying all thier bills and they will not work at a pie factory. The step daugther is the same age i'M 53 and her daugther is 20. The step grand daugther had the nerve to tell me that he is always going to do this , but he keep telling mne that he's tired but they do not have anyone. The mother has a 30 year old boy friend all she do is stay drunk and rise H.My husband is a good man but he is weak and they are using him and using the fact that her mother is dead they feel he should take care of them the rest of his life, but i say enough is enough. The reason i decided not to use the hot foot because he goes over there all the time for something they need something all the time, And i can't put it in the mail cause he still get some mail there.Please somebody help me figure this out. When you sprinkle down the hot foot powder in their path, then make sure that you say something to the effect of " I hot foot (their names) from my property and send them far away" Something like that. It does not matter that your husband comes into contact with the hot foot powder because your intentions are not for the husband but for the step daughter and step grand daughter. If you do not want to lay down foot tricks, then you can simply do a hot foot bottle, and send them down the river. If you cannot do that, I would send them away to a dead address. I think Miss Bri or another AIRR person mentioned that on here. If I can find the thread then I will post it. Thank you i really appreciate all your help. Starsinthesky is right. If you are hotfooting an area where your husband goes a lot then you can call out the specific names you want to get rid of and the understanding is that he is safe. However, if it were me I would create a hotfoot bottle spell to work on these family members. If you do decide to physically hotfoot their location I would buy some packs of the 13 herb uncrossing bath to use on your husband to make sure that he does not experience any adverse reactions to the work. To MissBri I am going to order the 13 herb bath form lucky mojo so how do I prepare a hot foot bottle? Thank you for all your advice it has been very helpful for my situation. This thread may be of some help to you to prepare a hot foot bottle. Thanks i will try it will let everyone know what happen. A few months ago I had an abrupt fall-out with a former best friend. He's unclear about what happened because we fell out (he sent very offensive words) before we had a chance to talk it over. For me the split is permanent and I have no interest in any resolution. The problems are 1. I'm good friends with his gf, we still meet up though we never talk about him; 2. We're in the same professional/social circle, though we avoid each other if we find ourselves in the same function. He's still emotionally attached to the situation and seems to follow my news, i.e. he sent an offensive email in attempt to provoke me to respond, the same day when I made an anonymous reference to him that touched on our broken friendship. My concerns are he may try to interfere with my friendship with his gf, who I consider a dear friend. And that he may sneak in a few bad words about me with our professional contacts. He has a strong vindictive streak and he's done drastic things to people who've 'hurt' him, like setting up web sites with twisted photo-shopped photos of his 'victims', along with sick stories he wrote, etc. He also does talk a lot. I'll get some Stop Gossip products with my next order, don't have it on hand. I'm thinking of doing a freezer jar but since I have never done it before, could you guys give me some insights on how to shape my petition, and what ingredients to use? I'm also thinking of working with Archangel Michael, just in case my former friend goes nuts. I was thinking stop gossip and freezer jar as well. And St. Michael would be great as a means of protection. In the freezer jar, I would include calamus, licorice, knot weed, poppy seeds, and mustard seeds. In addition, if you wanted you could put him in a mirror box, but I think everything else you are doing is quite enough. As for the petition, I would say something like..."freeze (target's name) tongue from speaking ill of me, actions to harm me, and presence out of my life" You can just play with that. I have a great friend who is also my partner in a sports/athletics-type sphere. We have a really good friendship and a incredibly productive training partnership. The problem is that he's like a brother to me, whereas he's attracted to me to the point where it's distracting and problematic. Any suggestions on diminishing the sexual component of his attachment to me without taking away from the beneficial parts of our relationship? You can draw his attention to a more ideal mate with Come to Me products or similar products from the love types. I think I would get some clarity and king solomon of wisdom going so that he is clear and understanding of what this partnership, and that you are both just friends. You can most definitely strengthen the relationship between him and his current partner. I would work with fire of love, stay with me, and come to me. In addition to the lovely advice given by starsinthesky7, here is a work to keep a man's eye on his current partner rather than you. Take a photo of him and his partner and dress it with Stay with Me oil. Set a lovers, or bride and groom candle on it dressed with the same oil. Get a white figure candle for yourself and dress it with Commanding oil. Set this figure candle off to the side and place a line of Cloves and Salt between you and the photo of the married couple. As you lay down this line, say "(Name) you are in love with your wife, and we are only friends. You want her, not me, you will chase after her, not me, you will give her all your attention not me. The only thing that passes this line is friendship and nothing more"
If he continues to be overly distracted with his attraction for you follow it up by cooling him off. Take an egg baptize it in his name, poke a hole and put in some Cloves and Calamus then cover up the hole with wax and place in the fridge over night. Not the freezer, the fridge. Next day take it out and break it on his property. Thank you so much, stars and Conjureman. Those are fantastic ideas and I'll get right on them! Hello I am new to this site and I have a couple of questions. 1) I want to get this person away from my family and I. Every time she is around all she does is cause problems. She was my sister's provider (liking cooking for her, helping her shower and doing her laundry). This is a 40 something yr old women. Yet she would never do her job and my sister has always complained about her taking her money and not doing her job. My mom would have to tell her to do her job. Well because of that I managed to get rid of her. Even called the cops to keep her away. She is always finding ways to get the job back. Since I was working with my sister she managed to take the job away from me. And she is always trying to figure out ways to come back into my parents house. For some reason every time this women comes and even when she took the job away, bad stuff started happening to us. Bad luck everywhere, even my sister has been having trouble with others. What can I use to get rid of this person? We have asked her to leave in numerous occasions. I would also like to get my job back and keep the peace in my family. 2) My other question is my husband had some trouble with some people at the prison where he was at. Now one of the Staff members keeps wanting to cause more problems for my husband and I. What can I use get this person to keep quiet and give my husband less punished? And for him to be released from prison. 1. Well with your first problem....I would do some BANISHING work to qet rid of that nasty woman if she's causinq your family trouble, obviously she's not wanted && people that don't belonq should not feel belonqed. You could also employ HOT FOOT is its for some intense work. I personally, after that work has been done, I would follow up with a wall of fiery protection, I'd buy the whole kit and pray to St. Michael Archanqel for help as well to protect you and your family from that hazzardous woman. 2. If someone is causinq problems for you and your husband while he is in prison, I'd work with the NINO INFANT of ATOCHA, the infant baby will assist him while he is locked up. And another would be to emply some STOP GOSSIP work to SHUT....The mouths of those who speak ill.....of you and him. HA! You can work the Kit, and then the honey jar to prevent any problems, and write the names of those who need to keep their mouths shut..
First protect you and your family and cleanse, cleanse your body and your homes. Then look into fiery wall of protection. TO rid the ppl from your lives use hot foot, perfect product for both problems. This forum has been a huge resource for me and I really appreciate the time folks have taken to give advice, it's been a huge help. I've got an issue that I'm not sure how to go about resolving. My adult step brother is a huge problem for my family. He constantly disrespects my mom and his dad, has no accountability for his actions and it seems like every time he comes over it causes a huge fight between my other-wise happy parents. They've tried to help him have a good start in life and he repays them by stealing from them and in general, just being a huge problem for everyone. I've done as much as I can on the mundane level (as have they), and the amount of energy it takes to cleanse the house and get the everything back to a happy state after he leaves is becoming exhausting. I want him gone, preferably for him to move away so these visits happen less often. I'm not sure what LM products to use. Money is fairly tight right now, so I'm taking that into consideration. Advice would be muchly appreciated. I didn't even think of Hot Footing! Would it be appropriate to create a vinegar bottle adding Run Devil Run and Hot Foot added to it? I, personally would do the Hot Foot work first to drive them away, and THEN the Vinegar jar. You don't want to sour them any further while they are still in direct contact of your family. This may make matters worsen. Work some Hot Foot (with some Run Devil Run if you wish) and after you get then to leave then go ahead and sour their lives with the vinegar jar. I have a couple of follow up questions. I have everything I need to do a Hot Foot Spell, but for the life of me I can't get one of his hairs. I have to be careful because I can't tell the difference between his and his dad's hair. His broken down car is sitting in our yard and I CSI'd that thing, but can't find a single hair. However, the car has a few scratches and I know I could get a few paint chips without it being obvious. Would that work? Also, should I start the spell on a Saturday or Tuesday? A while back I fell in love with a man who didn't return my feelings. I hoped there was some chance he'd change his mind, but after readings with two AIRR readers, the conclusion from one is that he has strong feelings for me but doesn't see himself with me; and from the other that there MIGHT be a chance but not in the immediate future. I did some spellwork on him (I had personal concerns) but no go. In fact a communication spell I did with a 7-day glass encased candle burned black and sooty almost completely. I have also used Follow Me Boy oil to attract new lovers but so far, while I've received attention from men, no one has appeared who I feel the same way about. I am ready to move on and draw TRUE love into my life. However, I am wary because about a month ago I received a love letter from a casual acquaintance who I have ZERO attraction to...in fact I'm downright repulsed by the guy, sorry to say. This person is very introverted and has had little experience with women despite being middle-aged. I don't think he's dangerous but he is clearly obsessed with me. So, I'm looking to do some twofold spellwork. 1) draw the RIGHT person to me, whoever that may be. If it ends up being the guy I fell for that would be great. But I truly don't think he's the right one, and I am finally ready to meet the guy I want to spend the rest of my life with. 2) at the same time, I want to discourage the attentions of the obsessed guy. And generally, discourage attention from inappropriate men. Use Banishing products on the guy you don't want. It's gentler than Hot Foot. If you live near him you can get the sachet powder, mix with local dirt and sprinkle it in a path where he'll walk on it and pray that he'll go away from you forever. You can use Come To Me Spell kit to draw the "perfect lover out of the universe", rather than just one specific person. I would use adam and eve products to find your true love, which you can use along with come to me if you wanted. Hi Determined. I am wanting to ask you the nature of the problem. This is a woman involved with your Ex, and about your daughter, if I understand correctly what you wrote. It is about keeping the woman in your Ex's life out of the life of your daughter, and any impression or influence she may have. I see that you are new to the Forum, and thank you for posting. I like your name very much. You could sign up for this week's Lucky Mojo Hoodoo Rootwork Hour. I recommend about once every 2 months that someone do this. Today it is you. I also believe with the three Members of AIRR that will be on tomorrow you will receive some very good advice. Certainly, you will still recieve advice if you don't sign up. I just don't want to "jump the gun" if you are are going to sign up and receive advice from my teacher and friend(s--all three), out of respect. This will be merged into the Hotfoot thread. I want you to have an opportunity to see it under it's title first. You can do a search in the upper right hand corner for possible answers as well. Casting a bunch of spells is not the same as one spell with clear and definite intention behind it. From your post, it would seem to me that you are definitely against this woman being involved in your ex's life, and your daughter's as well by extension. So to me, I would think you had the intention part down. That being said, you've already put it out there in the universe. It's time to watch it manifest. I agree with Tammi Lee's advice-getting a reading on this would be great. Typically the way I work is I prefer to hot foot and banish someone out of a person's life and then freeze them to keep them out. I am a fire and heat loving gal though-so those methods resonate with me. If you are not getting results from your freezer working then I would get a reading and you may need to try a different approach-that is all part of the magical process. hello Ms. Tammie sorry I haven't logged in a few days and just now seeing your responses. I want to get this female out of my ex's life. She is a childhood friend and they recently hooked up and are in a long distance relationship. She has never met my daughter and I plan to keep it that way. She is in town this weekend but me nor my daughter have been over to my ex's house since she arrived. Miss Bri is a wonderful Member of AIRR and she responded to this thread. You can see the link above. I would recommend Miss Cat or Miss Bri. It is a win win situation. I have a manager who doesn't like my boyfriend she always finds.an excuse for him not to come over it's really annoying me how do I drive her away with Hot Foot?? Driving someone away from their job is no small thing. Sure she might be annoying and unfair but personally, I'd try mixing some Influence sachet powder into some local dirt (to blend it in) and pray that X will be influenced to leave you and your boyfriend alone. Secondly, how does a manager of your apartment complex get to say who comes to your place? Unless your man has been formally banned from the place, you should be able to have whatever guests you want. She is causing rumors that he's a bad person trying to kick me out accusing me for random stuff being strict with me then any other person. She is just making things hard for me I do not want her here no more. Please explain more what is there to mix? Thanks again! Does she have a boss, or is this complex managed by a company? You should call them up and complain about this woman. Sometimes you have to work in the physical practical world as well as doing magic. and mix a bit of it with some of the dirt that's around your place. Mix it in so you don't see the powder anymore. Pray something over it like "May X (the name of the lady) be influenced to leave me and my man alone and at peace." Sprinkle that dirt mixture around her office or where she'll step on it. As she steps in it she'll get the spell on her. Thank you so much for your feedbacks. No.she is just yhe manager of the complex there is a boss of her but its impossible to complain I can't seem to get control of the boss of the person who bosses her. She is just the manager that's all. She's just causing a loy of problems for no reason my boyfriend id of good moral character. Can you please tell me more and what spells to use. I was looking into Hot Foot. Her office are going up on concrete floor there's no dirt only going down the solid ground around are flowers. You need to read the references on laying down tricks and try them out; the first link on foot track magick uses Hot Footing as an example of how to lay down the powders. You can use Banishing or Hot Foot if you just want her to get out of your life. You don't have to lay down a thick layer of dirt and powders to get the spell to work. Even on sidewalks there's dirt and tracks that get there, it's part of people using the walk way. Use some dirt from under a tree that grows near your house, mix it with Hot Foot, call out her name and tell her to get out and never come back and sprinkle this dirt powder around her office as you walk past it. Then take a cleansing bath to get that Hot Foot mess off of you. Take a bath in some Uncrossing or Cast Off evil bath crystals to do this. If you dont' want to deal with powders, get some Hot Foot oil and dab a few drops on the manager's door and doorknob so she touches it with her hands. It works the same way. Ok thanks very informative! I'm a bit confused I didn't knew you had to take a shower why is that?. Yes I want her to leave I don't want her here another question what if I do the powder and somebody else steps on it what will happen to that person?? Laying down Hot Foot is an enemy trick. You want to cleanse yourself physically from that energy which comes from handling Hot Foot. If you lay down powders and call out HER NAME alone, it won't affect others that step on it. You're "programming" it just for her. Can you VB please details me everything to do I'm gonna use Hot Foot' What cleansing do I use please. Thank you! There are resources all over Lucky Mojo on how to lay tricks and cleanse yourself. Look at the links I gave you and follow the directions. I'd also recommend thoroughly reading Miss cat's online book "Hoodoo in Theory and Practice" which teaches many of the basic tricks and cleansings in Hoodoo. Spiritual cleansing that is accomplished with a bath or series of baths. Please read the links I gave you and then come back and ask questions. I want to get rid of him but I don't want to hurt his feeling. what can I do? Banishing spells and products are a nice way of making someone go away. Good luck to you. And it is very thoughtful of you to not want to hurt his feelings. That is so nice. Instead of Stay With Me, consider Come To Me or Attraction. Instead of Break Up, use Banishing or Separation. 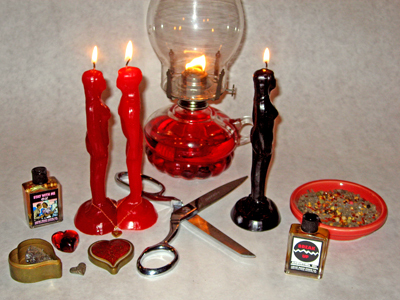 Name the male candle for him; the red female candle for "His Ideal Lover." Instead of a black female candle, buy a BLUE one and name it for yourself. I met a guy, we exchanged numbers and such, we met later that night and my gut told me that he's not the type of guy I want to be involved with on any level. The problem is he has my number and he tects me often, even him texting me gives me the same feeling illness/anxiety that says i shouldnt continue having contact with him. I only have a first name and his phone number to work with. Getting personal concerns is not something tjat is advisable or feasible for me. Any advice is greatly appreciated. Thank God that yu know to trut your gut feelings! Good lucky with that one! I've had luck getting rid of people by sending them to France. This is a good way to get rid of someone without hurting them (like sending them to the graveyard ect.) I haven't done this in a while so please correct me if I get anything wrong folks. First, make a black doll baby and fill it with dog grass and calamus (both are carried at lucky mojo) and dirt from the person's yard. Then mail the doll baby to france! The last time I did this I came home and the offending neighbors were packing their bags to move. Good job on following your gut, you probably saved yourself a lot of headache down the road. Good luck! Hello all! I EXTREMELY need your help. My daughter's father lost his place to stay about a month ago and I allowed him to spend the night, but the night turned into a month! He's rude, and at times downright nasty. He even acts as if my daughter and I are invading HIS space! I have asked him numerous times to leave and even threatened him with calling the police but he won't budge. We'll argue and when he comes back to my home, and I open the front door for him, he'll walk right past me without having the curteousy of at least waving his hand with a simple HI. I have section 8 and can get in trouble for him being there and he doesn't care. Instead he gives me all this bs about how dozens of ppl have section-8 and do this and don't get caught. I have told him, these ppl are way too dangerous for me and Idc to hear about others. Please, please help me to get him out pf my home and fast without my losing my section-8, getting in trouble and without him potentially harming me and my child. YIKES! He sounds like an in-law that come to visit for the week and ends up moving in. You really ought to notify social services or something also because you want to cover yourself. Hi Miss Aida, thank you so much for helping me with this. Unfortunately I cant even contact Social Services because I can get in trouble with them too. Hes just not caring nor getting it. Should I use protection work and something to gagg him from telling on me or telling others hes been staying here? I am now scared even more because yesterday my nosey neighbor questioned me if he was staying with me, and shes a snitch!